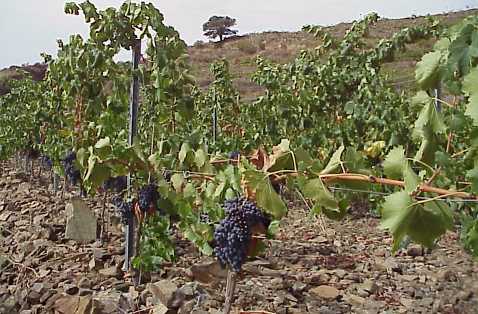 The Priorat area is of volcanic origin, which gives its soils unique features. The soil is acid, poor in organic matter but rich in slate. The Paleozoic bedrock, called llicorella, consists of reddish and black carboniferous slate with small particles of mica and quartzite that reflect and conserve the heat. In between the layers of slate is powdered clay, which holds water during the hot dry summers. During times of excessive rain, the steep sloping slate provides excellent drainage. Old vines (50 to 100 years old) can send their roots up to 20 metres deep into the rocks in search of moisture. These unique properties contribute to the quality of the wine: the wine is very concentrated, but the profits are low and the wine is expensive to produce.